Last week Akio Toyoda, president of Toyota Motor, apologized for his company’s poor financial performance and possible culpability in the death of an American family for faulty product.To this, I ask – what is the value of this conversation in the age of Social Media and where is the associated innovation? I worked extensively in Japan and apologies from CEOs are not uncommon. When All Nippon Airlines and Japan Airlines had a few runway incursions – both CEOs (competitive enemies) appeared together on national TV nearing tears and ending with a loooooooong bow of remorse. US media does not often get a chance to see this side of Japanese culture because of it’s intimacy, sensitivity, and frankly, it’s a little bit strange since scandal and corruption in Japan can be truly world class. 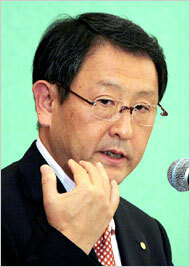 “I want Toyota to return to profit, so we can start paying taxes and go back to contributing to society,” he said. And in a peculiar show of deference, even the reporters gathered were issued an apology. ….and they go on and on…. I am still waiting for a single US Banker, Insurance company CEO, or Corporate executive to apologize for mismanagement and failing to sell worthy products. Not one – Sure, they will kowtow to the Congress or the courts, but not the people – all they need to do is look straight at the camera. Seat belts were not even installed in US automobiles for the first 60 years because they did not want to give the “impression” that automobiles were unsafe. “Sometimes, this apology business is a way to avoid taking real action or responsibility,” said Robert Dujarric, director of the Institute of Contemporary Japanese Studies at Temple University’s Japan campus. Toyoda again has set a new standard. This story is covered throughout social media space – most other big Japanese apologies had not. The difference between the US automaker and the Japanese is stark. Toyota intends to be the standard by which all other competitors are compared. When most are trying to lower the bar, Toyota raises it. That’s the value of conversational currency.